The CDC’s catch-up schedule can be found here. 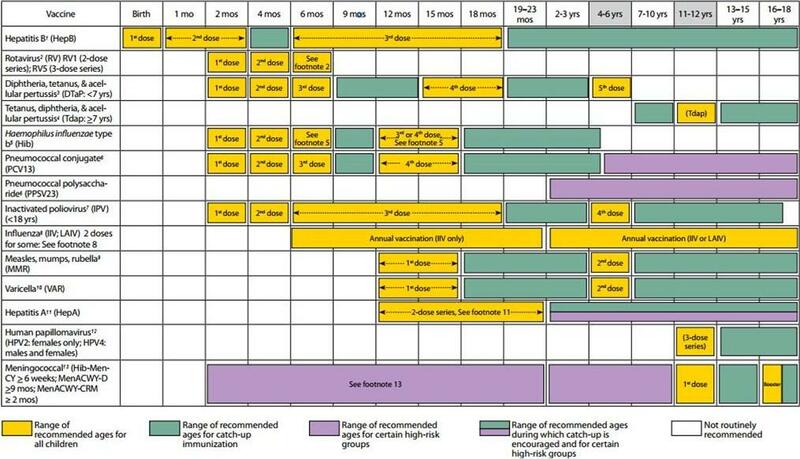 DTaP: The fifth dose of DTaP vaccine is not necessary if the fourth dose was administered at age 4 years or older. PCV: Administer 1 dose of PCV13 to all healthy children aged 24 through 59 months who are not completely vaccinated for their age. Polio: A fourth dose is not necessary if the third dose was administered at age 4 years or older and at least 6 months after the previous dose. Meningococcal: If the first dose is administered at age 16 years or older, a booster dose is not needed.